Twitter is to my mind, the most powerful social media platform for building visibility, influence and trust; and the only truly open, global platform that allows you to connect with anyone who is there simply by reaching out to them. Despite this, reports show low levels of adoption of Twitter by leaders. Some who adopt it use it well but most leaders simply post links to content about themselves or their businesses. While there is a place for that, it’s in a mix of content that includes sharing interesting information from others. Then there’s the absolute no-no of social media, ignoring people. Imagine if in real life you went to a dinner party and just spoke at a person and ignored everything they tried to say. You’d be struck off the guest list fast and that is exactly what happens on Twitter. When I teach Twitter the first thing I say is that if you do nothing else, check Notifications. This is where you can see who has contacted you, or shared or liked your content and respond. I think that is because unlike Facebook or Instagram, Twitter is the least intuitive of the social media platforms and so requires more learning to maximize its potential. 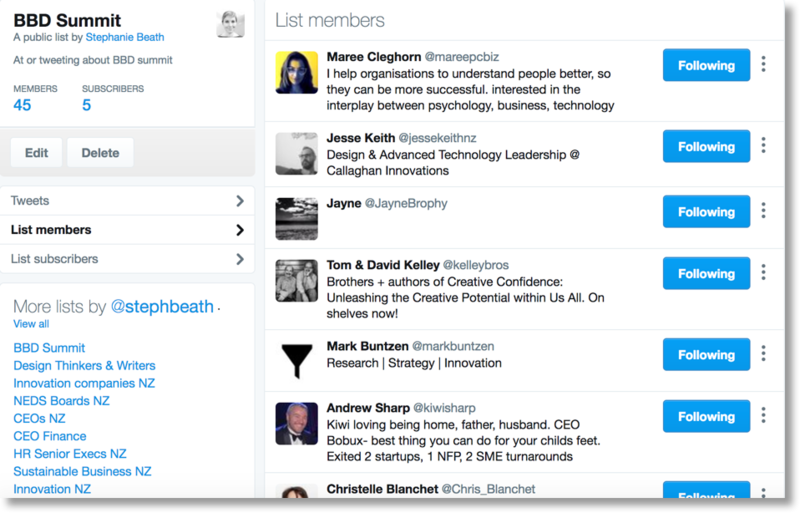 One brilliant tool that helps you be strategic and cut out noise, is the Twitter list. Twitter is a flowing river of more than 500 million tweets a day, which is why newcomers approach it with trepidation. It may seem overwhelming but the reality is you are not interested in all those tweets, only certain people or topics. Here the power of Twitter’s search engine really comes into its own. 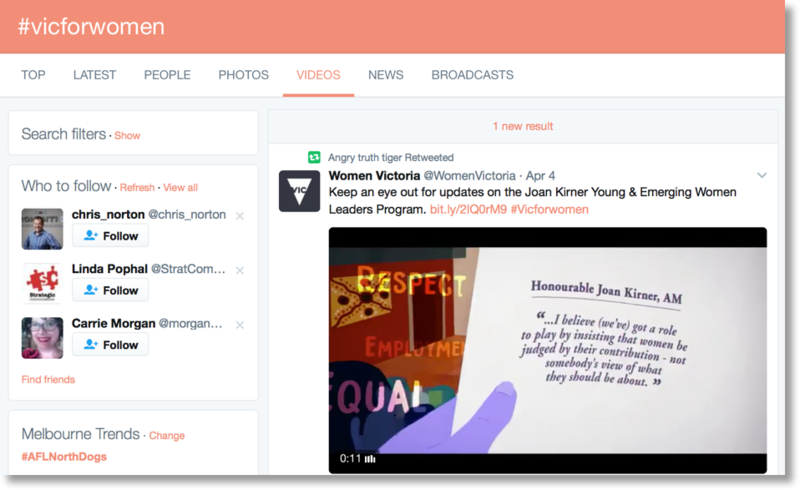 People are easily searchable using the @ symbol (@dionnelew) and the # hashtag with a topic (#contentmarketing). 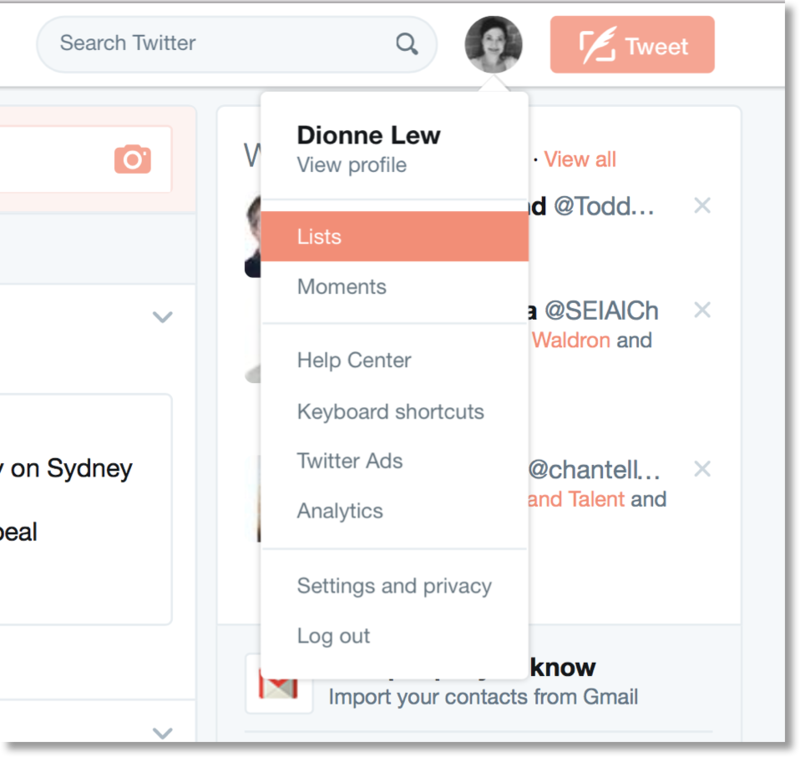 A Twitter list allows you to further segment people or topics and create an instant shortcut to their feed that allows you to source and share content and build relationships. 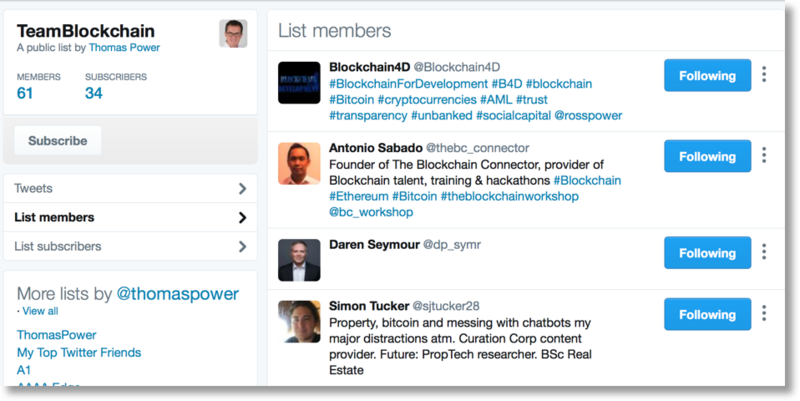 Building a Twitter list is easy, just go to the menu that lives behind your photo or avatar, scroll down and select Lists. On the top right, you’ll see a box that allows you to Create new list. Give the list a name and description and choose if it’s public or private. A public list has many benefits, such as a subscription function so that others can join your list, a member button so that others can see who is in that community of interest and a URL that can be shared and integrated into marketing. Private lists are also useful, you can follow competitors for example and check in what they are doing every morning, create a shortlist of candidates you may be considering to see how they behave online in real time. Because what people do on Twitter is public this doesn’t overstep any privacy boundaries, it just orders information into categories. It’s as simple as that. The real gold is how you use them. I love organisations that create lists of their people, it’s so human and reinforces their importance. A name, face and insights from a feed give you a real sense about who the person is and what they stand for. 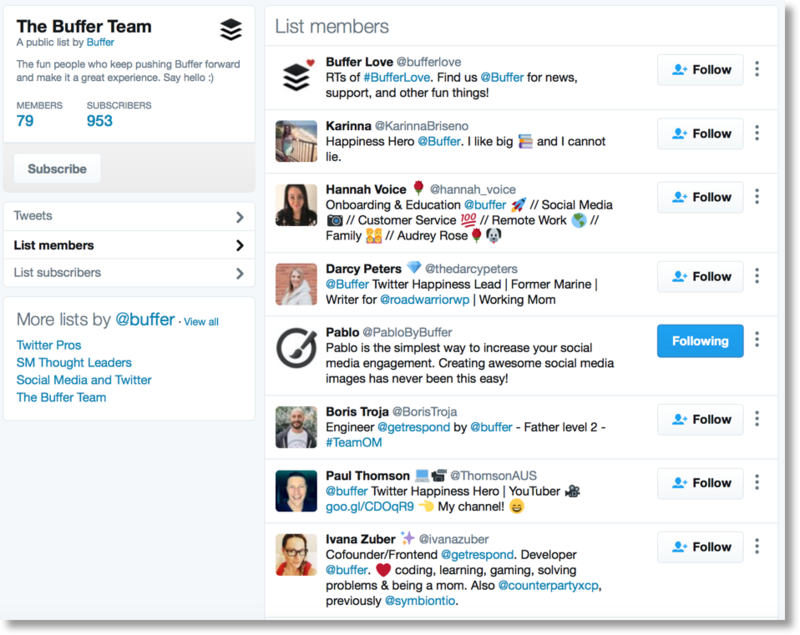 Buffer does this nicely and it’s particularly important as they are a ‘fully distributed team’, which means they work remotely from around the world. 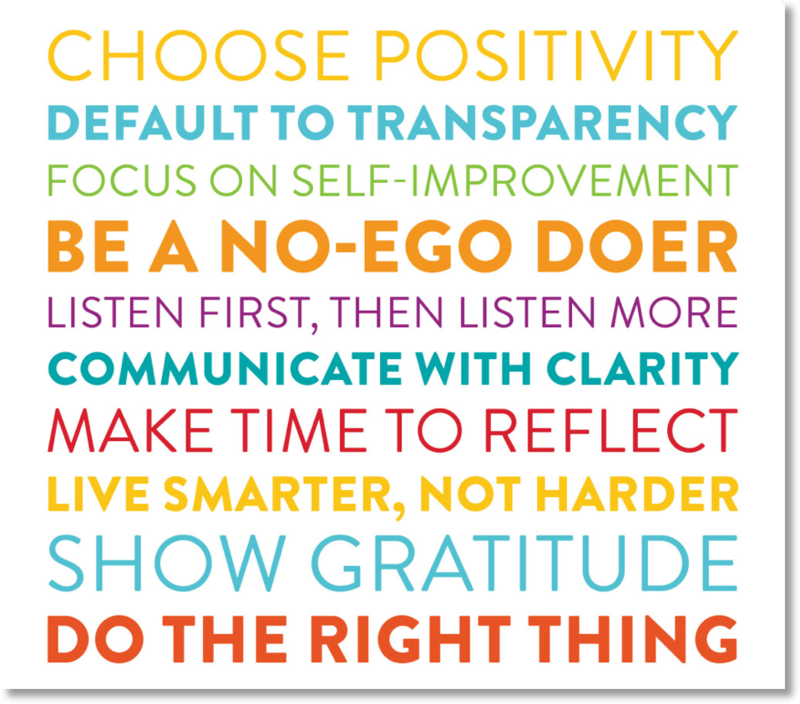 It also reinforces what Buffer stands for – radical transparency and new ways of working – values they showcase across all their content. But you can use it effectively whether you’re a small business, startup, distributed workplace, multinational or even sole entrepreneur, just to have a bit of fun with the team-of-one idea, which again, speaks to the brand and will give people a lot of information at a glance. Because a list has a URL (just look at the URL address when the team list is open) you can use it in other forms of communication, for example, sending an email or including it as an email signature. Just like a team list a client list is a very useful way to stay useful, I would keep this one private. This is a great way to give a hat-tip to people whose products and service you value and would recommend because it’s an automatic brand association. If you don’t want to go public then it’s a great way to keep in touch with what your suppliers are doing and recommending, even special events or products. Because a conference hashtag remains searchable after an event you can go back and by clicking on the hashtag look at what happened from multiple perspectives, from the top tweets and people to photos, videos, news and broadcasts. This provides a rich source of information for the archive but can also boost the effectiveness of public communications by giving insights into what kinds of tweets were favorited or shared the most. You can add someone to a Twitter list without following them. 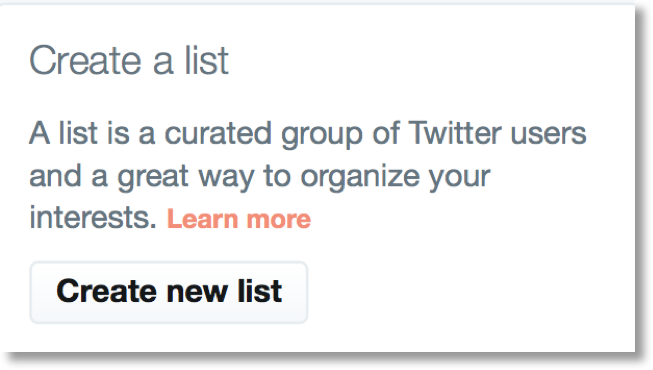 If the list is public, Twitter will notify them that they have been added to the list. When a list is private, because only you can see it, they are not notified. This means you can create lists that reach people who you know will be interested in an event or issue ahead of time, much like the embargoed press release of old. Often you know best who your clients or prospective clients are, what interests them and what information they’d find useful. In a time-poor world sharing useful resources gets you in front of people you’d like to draw closer and reinforces a relationship that’s already in place. If you’re a marketing and communications recruiter, create a list of go-to experts or resources for each niche, for example, Best Corporate Affairs Bloggers, Best Full Stack Marketing Influencers, Best Online Reputation Management Guides, Regulated Agencies Using Social Media. A government agency working in homelessness or domestic violence support, for example, could provide a list of all emergency accommodation providers, it could be further segmented by region. If you’re a content, social PR agency you could build a list to the official Twitter accounts of the key Social Media Platforms, so that your peers can find out at a glance what has been announced each day, I have one here. A traditional publisher could develop author lists and share them with all new authors as they are on boarded to build an online community of support. An author agent can build a list of agents they rate for writers. Nothing says confidence like showcasing competitors and in highly competitive areas where people are time poor it’s a way of being helpful without shoving people out your door and into an abyss. People in niche communities are often highly engaged because they’re focused on an area rather than general trends. Herding the cats is an act of generosity often richly appreciated. Thomas Power, for example, has brought together a list of people involved in #blockchain. What communities are the people you are trying to reach or influence interested in? Build and share those communities on their behalf. Again, this makes you visible and helpful and over time, builds trust. Creating global lists of professional membership bodies and detailed lists of people who are in them has numerous advantages. One thing you learn quickly online is that people are generally very generous sharing what they know. Although it’s useful to build lists from scratch many people have already been where you want to go, and there’s no point reinventing the wheel. You can find out where the best lists are through Google or by following experts who make recommendations and keep all these kind people housed together. 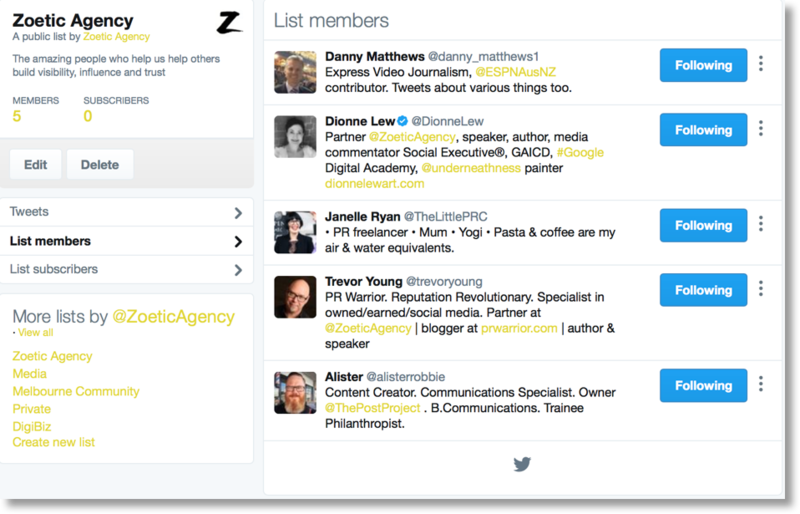 Twitter lists can help you curate amazing online resources into strategic, useful categories that get you in front of and engaged with people and information that matters to you or your customers or communities. The only limit to their utility is your creativity. How have you used them? What other ideas do you have? Please share. This entry was posted in Social media and tagged lists, Twitter. Bookmark the permalink.